Tom Steyer, who founded the Need to Impeach organization in 2017 to campaign for the removal of President Donald Trump from office, is holding a town hall in Springfield, Mass Tuesday Feb 12. A billionaire liberal activist is bringing his national campaign to oust President Donald Trump to western Massachusetts today. 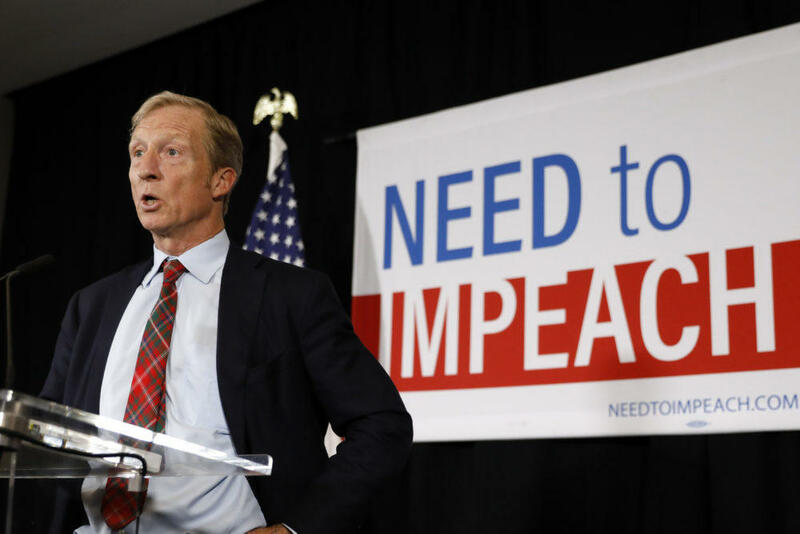 Tom Steyer, founder of the Need to Impeach organization, is holding a town hall in Springfield tonight as part of an effort to get Democratic Congressman Richard Neal on board the impeachment train. "We are going to have a town hall in Springfield to talk about the need to get the impeachment process going as soon as possible and get rid of our lawless president, Steyer said in an interview this morning. Earlier this month, Steyer’s campaign started running TV ads in Springfield targeting Neal. "It's time to hold Donald Trump accountable and we can do our part here in Massachusetts. All we need is for our Congressman Richard Neal to be with us," the ad states. The group is also paying people to go door-to-door and make phone calls in Neal’s district. So far, 21,000 people in the overwhelmingly Democratic district have signed a petition supporting impeachment. "Overwhelmingly the people in Congressman Neal's district agree with me," said Steyer. Neal is being targeted because as chairman of the powerful House Ways and Means Committee he has the statutory authority to request the president’s tax returns. Speaking on WAMC’s Congressional Corner recently, Neal said he will be “methodical” and “judicious” when it comes to seeking Trump’s tax documents. "What we are trying to do is lay out a case and much of this will be done privately because it is in fact going to be a court case," Neal told WAMC's Dr. Alan Chartock. "I don't know any attorney who would say you should argue the court case before it is ready." Steyer is frustrated by the Democratic Congressional leadership’s decision to slow-walk the request for Trump’s tax returns. "We are about a month-and-a-half into Democratic control of the House and now the explanation is we are going to move deliberately, carefully and wait for all kinds of things," said Steyer. " In fact, if we are going to get this president's transgressions on the record we can't wait because we are going to run out of time." Since launching his campaign to impeach Trump in October 2017, Steyer said he’s held more than 40 town halls across the country to lay out his case and build up grassroots support. Now he’s begun a new phase of the campaign that focuses on key Democratic House members who he says can get the impeachment ball rolling. "The people are overwhelmingly on our side. If you go inside The Beltway, then you see people are dragging their feet and move as slowly as possible and this is the last thing in the world they want to talk about," said Steyer. Steyer, who ran a hedge fund for 26 years, sold his shares in 2012, and turned his attention to political activism and environmental causes, said impeaching Trump is not a pipedream. "It is a question of the American people getting up on their hind legs and insisting on it and I think that will happen," said Styer. "Events will make it clear that (Trump) is someone who is unfit for office and dangerous for the American people and our way of life." Tim Vercellotti, Professor of Political Science and Director of the Polling Institute at Western New England University, said what Steyer is doing is unprecedented. "We can look back to President Clinton and the impeachment proceedings of the late '90s, there were conservative groups involved, but in a covert way," said Vercellotti. "This is the first time we've seen an individual bankrolling TV spots and engaging in a very public effort to persuade the public that impeachment should be the way to go." It appears, however, that Steyer’s campaign has yet to move the needle much on public opinion when it comes to impeaching Trump. "It really depends on the wording of the question, but what we've seen in polling in the last several months is a country that is fairly divided," said Vercellotti. "There is no clear signal from the public right now about impeachment." Steyer’s town hall in Springfield is at Cedars Banquet Facility on Island Pond Road. Doors open at 6:30 p.m.
Allan Lichtman is a political historian and Distinguished Professor of History at American University. Lichtman predicts that an impeachment investigation will be launched and lays out the factors that, he believes, will lead to Trump’s removal from office. From Robert Mueller’s Russia inquiry, to President Trump’s foreign policy moves and conflicts of interest– not to mention his Twitter account – Lichtman warns that Trump’s rogue presidency is approaching a critical mass of violations that could trigger his impeachment – but only if the American people demand it. Lichtman’s new book, “The Case for Impeachment,” contains new material assessing how Trump’s first year in office has strengthened the case for his impeachment, and explaining exactly how he could be removed from office. Lanny J. Davis is a lawyer who served as special counsel to President Bill Clinton and was a spokesperson for the president and the White House on matters concerning campaign finance and other legal issues. In his new book, "The Unmaking Of The President 2016: How FBI Director James Comey Cost Hillary Clinton The Presidency," Davis puts forth his case for Donald Trump’s impeachment by showing how the actions of the FBI and Director James Comey in the months leading up to the 2016 election interfered with a fair, uncorrupt election. Lanny Davis says his abuse of power since becoming president justifies initiating a serious investigation to impeach him or remove him for mental impairment under the 25th Amendment. It’s a tumultuous time in the world economy. In today’s Congressional Corner, Massachusetts Congressman Richard Neal continues his conversation with WAMC’s Alan Chartock. The House Ways & Means Committee has a new chairman. In today’s Congressional Corner, Massachusetts Congressman Richard Neal speaks with WAMC’s Alan Chartock. An aircraft hangar will be built in western Massachusetts where maintenance will be done on the largest planes in America’s military fleet. The sizable investment by the Pentagon should also help assure the future of a key component of the region’s economy.